“These powerful doors are giving us a much greater spread without any reduction in catch rates, while retaining normal, or even reduced, fuel consumption,” he said during the first trip with the new doors. 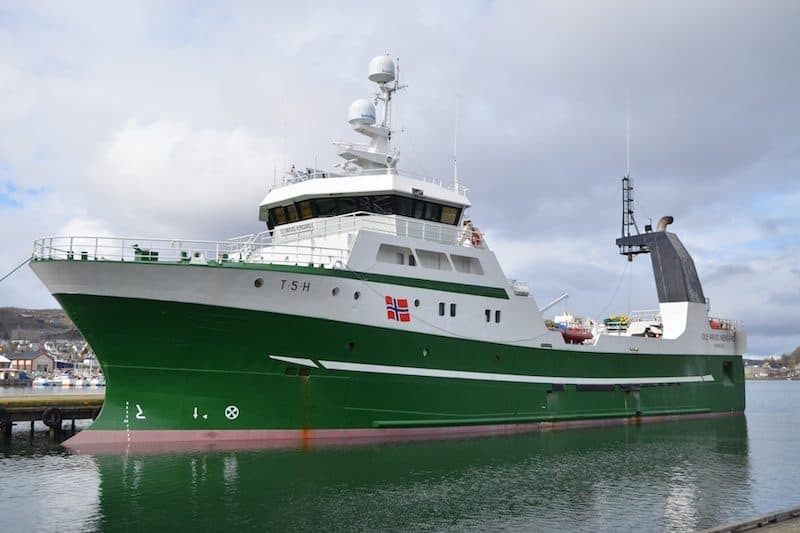 Norwegian twin-rig trawler Ole-Arvid Nergård operates in the Barents Sea, in the Svalbard zone and off the Norwegian coast, fishing mainly for cod, saithe, haddock, redfish and shrimps. 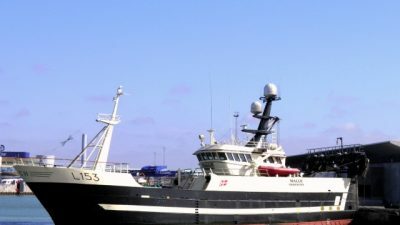 Co-skipper Tonni Karlsen works with a crew of 17 on trips of around five weeks, aiming to fill the 54 metre trawler’s 420 tonne capacity refrigerated fishroom, and with it’s important that this target is hit within the expected trip duration. 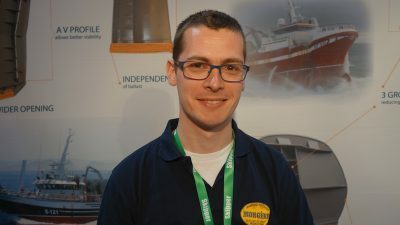 “So it’s important that when we considered changing our trawl door supplier that we didn’t sacrifice any catch-per-tow volume even if the spread was improved,” explained Tonni. “But we certainly have no concerns with these new Type 23 Bluestream doors as they have increased the spread of our gear by an amazing 50 metres and without losing any catching capacity in the process,” he said, adding that with the new doors, the vessel’s fuel consumption has not increased and, if anything, is even slightly less than with their previous doors. 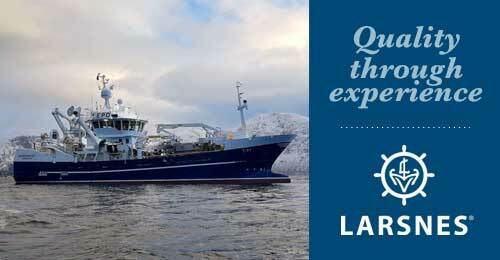 “What is fantastic about these doors is the fact that they start to square the moment you start shooting away the gear, so when the trawl hits bottom you can see that you already have the maximum spread that you need — and they are so stable that they maintain this spread through the duration of the tow without any problems,” he concluded. 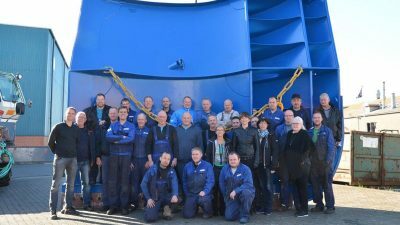 Despite all the fanfare over the Type 23 Bluestream trawl doors, this latest achievement in a long line of success stories comes as no surprise to Ole Kjærgaard, who has been with Thyborøn Trawldoor for more than 25 years. 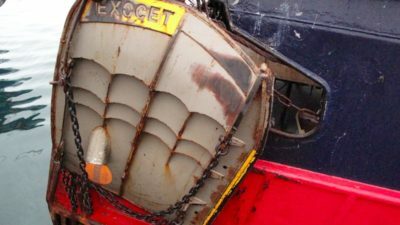 “When fuel prices are not to the fisherman’s advantage, it’s nice for us to be the ones who can provide a fully functional and more economical solution without any drop in catch rates,” he said. “More spread with less resistance has always been our target,” he said. Explaining that the Type 23 Bluestream doors are constructed using the same high-grade steel as is used in shipbuilding, Ole Kjærgaard commented that this combination of high-quality materials from SSAB and skilled craftsmanship ensures less maintenance for users of these doors, who also have the security in knowing that the quality reputation of Thyborøn Trawldoor is behind them. The Type 23 Bluestream doors are the result of the company’s ongoing investment in R&D, and follow the experience gained with the Type 14 doors and the Type 22 Bluestream design which introduced high-efficiency foil technology that forces water through the foils to generate an exceptionally powerful spreading force, combined with a lower overall drag from the doors. According to Ole Kjærgaard, a great deal of work has been dedicated to this development project, followed by a long spell of testing, improvement and troubleshooting to ensure that the new doors were exactly right. “We were very satisfied after the first trials when we saw that these Type 23 Bluestream doors show their real value,” he said, commenting that while it’s satisfying to see successful trials, positive comments from a skipper working with these doors under tough conditions is what proves this technology works and is here to stay.